We offer a wide range of electrode sensors such as wire suspension, solid rod, gland plug, ruggedized and concentric electrode sensor. When necessary, special equipment can also be supplied to meet specific needs. When selecting electrode sensors an important factor is to consider the specific characteristics of the liquid involved, the lengths required to obtain the desired control of levels, and the physical nature of the container. B/W Controls' line of electrodes has been developed to provide a practical, economical solution to almost every conceivable application and installation problem. 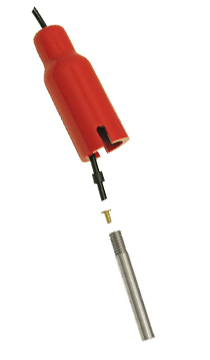 Our electrode sensors are available in several varieties: solid rod (rigid), wire suspension, and standard gland plugs for high vibration applications. In addition, we offer custom options made per customer’s requirements. Electrodes made from 316SS, Brass, Monel, Nickel, Carpenter 20, Hastelloy B, Hastelloy C, and Titanium provide compatibility for almost all applications and environments. Some of the applications that the B/W Controls electrode sensors are ideal for are sewage pumping stations, elevated tanks, shallow and deep wells, hydropneumatic tank, storm drain type, cooling towers and many more. Take a look at our Electrode Holder & Electrode Sensors Catalog where you will find our full range of electrode sensors. In the Electrode Holder & Electrode Sensors Catalog you will also find our selection of electrode holders along with a guide for selecting the electrode and electrode holder that fits your exact need.